Live, work, raise a family, prosper, enjoy! Bay County is all those things and much more. Opportunity is embedded throughout our fabric. Named in 2010 as the #1 Metro Area for Economic Growth Potential in the U.S., Bay County sits on the cusp of dramatic growth. Best known for having the “world’s most beautiful beaches”, Bay County is emerging as Florida’s next economic engine. The area is focused on aerospace, technology, manufacturing, distribution/logistics, retail and, of course, tourism development. Bay County is located in the heart of the Florida Panhandle and at the center of the southeast U.S. Gulf Coast. 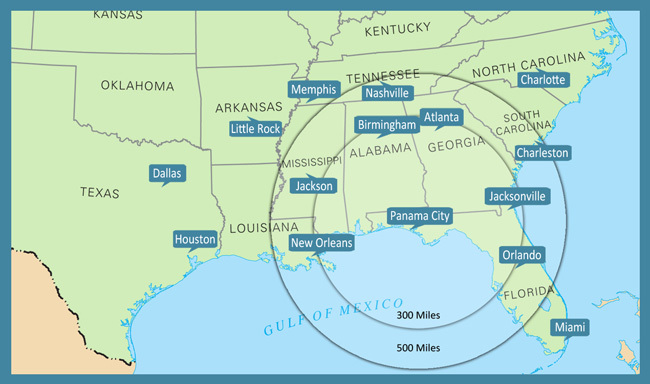 This growing area is also surrounded by seven military bases that stretch across northwest Florida and southeast Alabama. This stable military presence provides a strong defense and aerospace supplier sector that further enhances the economy. In addition, Bay County is home to one of the nation’s newest international airports centered in a commercial growth area just north of Panama City Beach. With a 10,000 foot runway and available sites adjacent, Bay County offers a clean canvas to construct any type aviation project. Both local elected and private sector leaders unanimously support the growth potential for the Bay region. The state, county and cities’ leadership have committed tax dollars to provide the necessary infrastructure to foster the projected growth and to ensure that companies are able to operate in a seamless business environment. Most strikingly was the support for development of a new international airport, plus continued advocacy for port expansion, quality education opportunities, a trainable workforce and a top notch road/highway system. The 2010 Census reported that 168,852 people live in Bay County. A recent Florida State University study indicates that Bay County’s population in 2040 is projected to be slightly more than 225,000. On average, Bay County has added 2,300 people per year and that growth is projected to continue at least by the same rate over the next 20 years. Within a 60-mile radius of the new Northwest Florida Beaches International Airport, the population increases to 573,000. 2. Connectivity to the World Where to start? A new international airport. A vibrant port that connects the region to the world. North/South rail connectivity to CSX railroad just north of I-10. Two four-lane connections to I-10. Together this connectivity create a strategic position for Bay County that provides a strong distribution network for movement of goods into and out of the area. Military stability. Both words reflect the strength of being surrounded by seven military bases. In addition, Bay County has been home to the Air Force, Navy and Coast Guard since the 1930s and 1940s. Just to our west is the nation’s largest air force base, Eglin Air Force Base, which is the anchor to one of the largest military base footprints in the U.S. The military bases have also created a strong aerospace and defense cluster throughout the region by attracting global aerospace/defense companies and hundreds of suppliers. More than 400 aerospace companies operate in the 10-county northwest Florida region. This strong presence stretches from Louisiana to Florida and helps form the world’s fourth largest aerospace/defense/aviation corridor. Essential in today’s site selection criteria is the availability of a skilled or trainable workforce which has become the new economic currency. Bay County has a labor force approaching 100,000 and access to more than 282,000 people encompassed in a 90-minute commute. The five area colleges and universities are at the heart of the area’s ability to provide a strong student base for workforce. For approved new and expansion projects, the Gulf Coast Workforce Center can coordinate a training program based on a company’s criteria and designed to provide a pool of qualified workers. Within the workforce numbers, a hidden supply of highly-skilled and educated workers are found in recent college graduates, the under-employed, exiting and retired military personnel and military spouses. Many people exiting the military choose to remain in the area, providing the marketplace with well-trained, innovative engineers, scientists and researchers who are ready to enter the civilian workforce. The Bay Region is blessed with both public and private leaders focused on quality economic development and committed to attracting the best companies to the area. Business leaders and elected officials have seen the benefits of leveraging their regional resources and partnering together for the greater good of northwest Florida. The unified objective is to make the region more competitive for quality growth projects and help each locale reach its economic potential. Across Bay County, we have numerous industrial and commercial sites primed and ready for growth. In addition, there are currently several available buildings that fit the needs of a call center or various sized manufacturing projects. The available sites and buildings highlight the diversity in industry cluster that epitomizes Bay County. For specific sites/buildings, click here to review the Inventory Section. Sun, sand, symphony, great schools and a spirit of entrepreneurship. Combined, they underscore the exceptional quality of life enjoyed throughout the Bay area. Studies show that an good quality of life attracts excellent workers. Every region is looking for a competitive advantage and when you can combine a wonderful place to live with an emerging diverse economy, it does attract and keep the best and brightest workers. From boating to Broadway shows, deep sea fishing to bird watching, world-class golf to world-class schools, there’s something to please everyone in the Bay region.